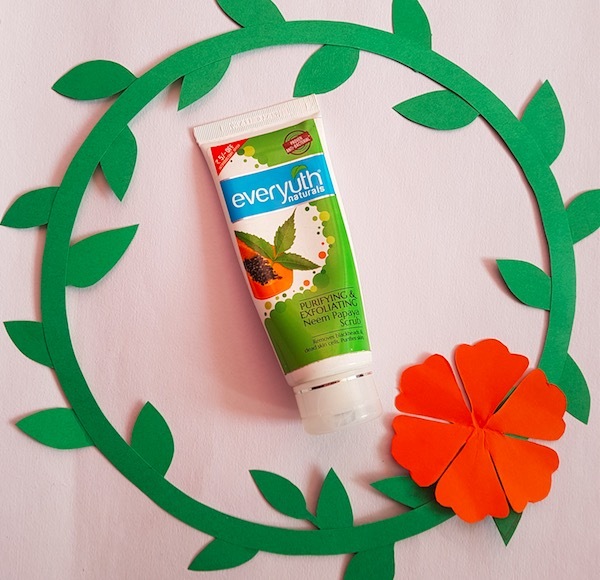 Today’s review is about the Everyuth Purifying & Exfoliating Neem Papaya face scrub. 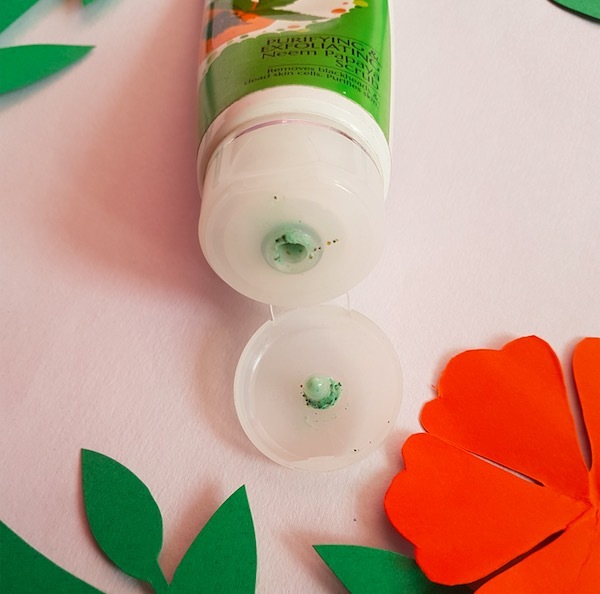 It is enriched with the natural extracts of neem and papaya and claims to eliminate blackheads leaving the skin clean and bright. 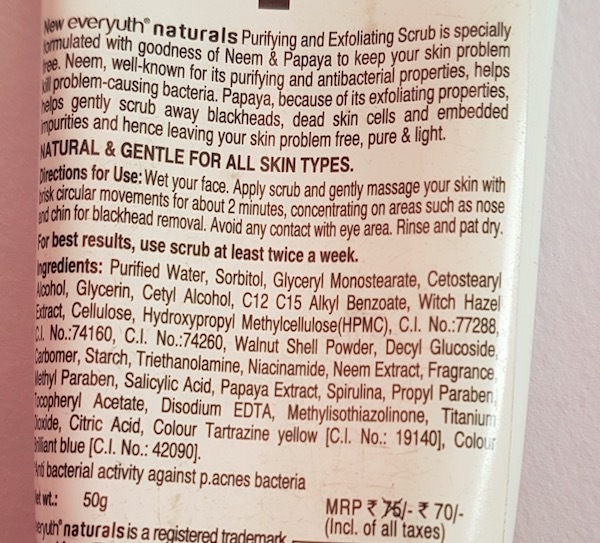 The price of the Everyuth Purifying & Exfoliating Neem Papaya Scrub is Rs.70 for 50g, and it is available at local beauty stores and online as well. My Experience: I have combination skin which is prone to whiteheads, blackheads and open pores. It is necessary for me to use a good face scrub 3-4 times a week to keep my skin clean and breakout-free. I always prefer skincare products that contain extracts of ingredients like neem, tea tree, lavender, lemongrass, to name a few. Some time back I spotted this face scrub at a local store and couldn’t resist myself from buying it. 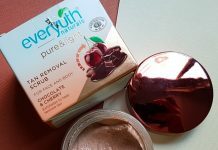 Everyuth is a well-known brand and has been in the beauty market for a long time now. 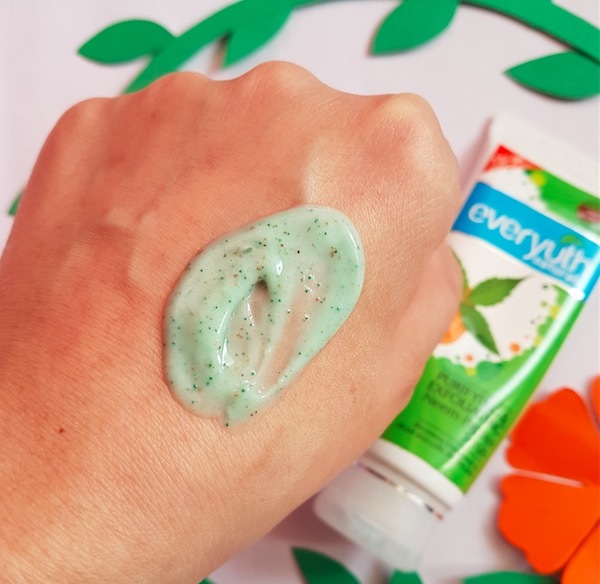 I did try many Eeveryuth products, and their orange peel-off mask is my all time favourite. 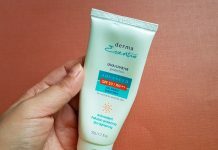 This face scrub comes in a lightweight cream form and has loads of tiny beads. It has a herbal neem fragrance that you find in neem bathing soaps. I take a generous amount of the scrub and massage it on my clean, yet damp face. I keep rubbing it gently with my fingertips focusing on my nose, inner-cheek area, chin and forehead. Due to its creamy consistency, it spreads without much effort and exfoliates dead skin nicely. It does remove tiny whiteheads and after washing it off skin feels fresh and bright. Although, it doesn’t extract blackheads and for that, I always use a blackhead extraction tool. 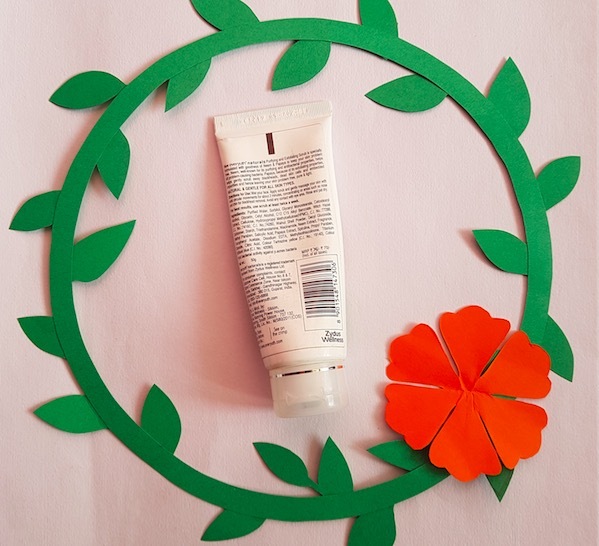 The face scrub comes in a hygienic, convenient to use and travel-friendly tube packaging. The scrubbing beads are gentle on the skin and don’t cause any irritation or allergy. 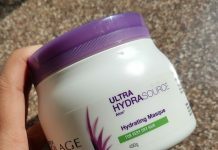 It removes dead cells leaving the skin clean and bright. Neem has the antifungal and anti-bacterial action that helps fighting germs, keeping skin pimple free. It is not useful in removing blackheads. Overall, this neem and papaya face scrub exfoliates the dead skin leaving the face clean and fresh. However, don't expect it to remove those stubborn blackheads. Still, if you are looking for an affordable, gentle face scrub, then you can consider buying it.